Earlier today, Martine of Dainty Mom shared an article from Huff Post Parents. I think this is something that all moms should read since it discusses a very hot topic among us moms — whether to breastfeed or formula feed. I am a mom of two and have tried all feeding methods. I formula fed The Princess. I exclusively breastfed The Little Man a little more than five months and combo fed him after. And I received all sorts of reactions with all the feeding methods I tried. When I was a formula mom, other moms would tell me that I should have breastfed my little one because “it is best for baby.” When I gave breastfeeding a try, I often get awkward (and sometimes malicious) stares even if I use a nursing cover while I feed The Little Man. 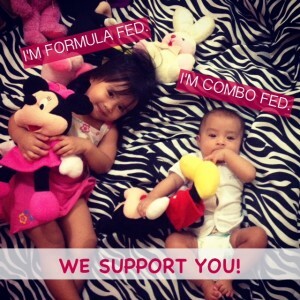 When I started combo feeding, I felt a bit hesitant to go out in the open because I’m not sure how people will react. When I did “come out,” others reacted with disappointment while there are some who commended me for being honest and open about it. Why was I so worried about how other people will react? These are my kids and this is my body! Mothers shouldn’t be too conscious about what other people will think about our feeding choices. Yes, breastfeeding really is the healthiest option for mom and baby. But, let’s say, you’re not happy or comfortable about it. I’ve actually talked to some moms who said that breastfeeding stresses–even depresses–them. Let’s not judge. Giving birth and taking care of another human being is hard enough; let’s not add more stress on each other with the whole formula feeding versus breastfeeding debate. I remember having a conversation with my OB about this whole breastfeeding debate. Although she encourages patients to breastfeed, she doesn’t condemn them when they do decide to formula feed later on. “Not breastfeeding your child doesn’t make you less of a mother,” she told me. Amen. I admit, I preached the breast is best gospel myself, and I find that while it’s great to have a voice, it’s also better to have a heart.